FORTY DAIRY COWS, 260 pigs, 200 goats and 1,000 chicks will be travelling to Rwanda in order to benefit genocide widows. The flight will be the biggest ever to leave Ireland with so many animals on board – 1,500 in total. The flight is being organised by Bóthar, a charity organisation that uses livestock. The historic flight which departs Shannon Airport on 10 October, marks the 25th anniversary of the first Bóthar flight, which left the same airport 25 years ago with a cargo of just 20 cows. Upon arrival in Rwanda, the livestock will be divided among widows of the horrific genocide of the mid-1990s. “Every new recipient undergoes significant training before they receive their animal. All the decisions are made at local level and each recipient is chosen by the village elders,” said Kate Finucane of Bothar. While the unconventional idea came from one of the aid agency’s staff meetings, four of their employees will be caring for the animals on the flight. The animals enjoy their normal diet during the day of the flight and fast for two hours before getting on the flight. They are fed nothing during the flight. As for the animal’s welfare on board the plane, the Bothar spokeswoman said that the aid agency applies international animal welfare standards, rules and regulations to all their animal transportations. “On the flight, a professional groomsman will ensure that all animals are in a relaxed state. Normally, all animals would be in a standing position for the duration of the flight,” she said. This will be the most significant airlift Bóthar will have ever pulled together. “It’s our biggest airlift in terms of numbers and species and, in that regard, a record in an Irish context. “We have achieved a lot in the past 25 years. We now have programmes in 19 countries worldwide,” she said. Niall Maloney, operations director at Shannon Airport, told The Journal.ie that they have been airlifting cows, in particular, from Shannon to some of the most-needy people in the world for a quarter of a century. “It was just supposed to have been a once-off. Thankfully for tens of thousands of people across the world it hasn’t stopped rolling since,” he said. Email “Forty cows, 260 pigs and 200 goats will be getting on a plane from Shannon Airport to Rwanda”. 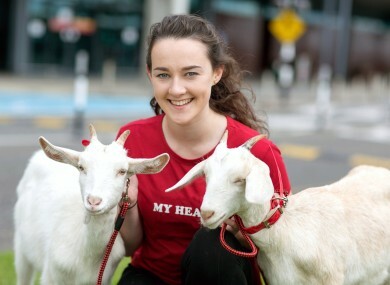 Feedback on “Forty cows, 260 pigs and 200 goats will be getting on a plane from Shannon Airport to Rwanda”.